Stellar (XLMUSD) has shown bullish rout upon the formations of back-to-back hammers during early February. 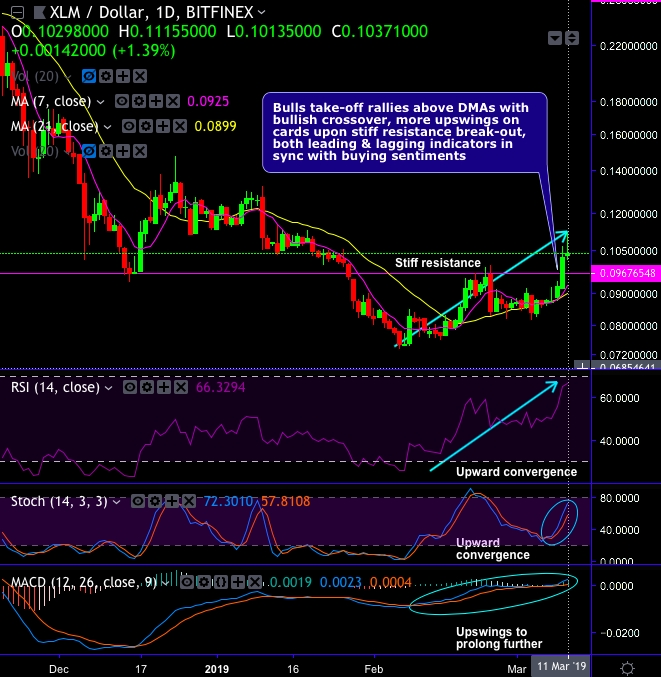 The pair has formed these bullish patterns at 0.081624 and 0.081669 levels respectively. Ever since then, it has rallied considerable upswings of over 24% in the last one and a half months. Amid this process, bulls have managed to break-out the stiff resistance of 0.09676548 levels decisively. Stellar Lumens surpassed TRON to become the 9thlargest cryptocurrency by market cap at just over US$ 1,486,995,765. XLM is perceived as an alternative to Ripple (XRP). Both are meant for redefining global finance. The prime objective of Stellar is to serve the non-banking space. This coin offers a wide range of services to make up the efficient ecosystem, like, micropayments, remittances, etc. Currency Strength Index: FxWirePro's hourly BTC spot index is flashing -74 (which is bearish), while the hourly USD spot index was at -55 levels (bearish) at 17:40 GMT.